FXpansion Etch: can sound both subtle and in your face. MUSIKMESSE 2012: FXpansion has followed up its awesome Tremor drum machine with the release of Etch, a filtering effect that also features distortion and compression stages. Promising to do "amazing things to all kinds of audio material," it's available now from the FXpansion web shop priced at £69. Details below. FXpansion is proud to present Etch, a versatile filtering effect based on DCAM circuit-modelled technology. Etch's dual filters let you switch between 4 models for all manner of fat and warm subtractive tone-shaping, with a comb filter type providing mind-bending psychedelic effects. Additional distortion and compressor stages are provided for beefing up signals, and FXpansion's TransMod modulation system lets you animate Etch's circuits over time. Use inter-modulating LFOs, envelopes and more to drive the filter cutoffs, distortion level, compression amount or any other parameters. Etch does amazing things to all kinds of audio material and is great for subtle warming, deep tone sculpting, wild sweeps, special effects and experimental sonics. Etch is available as a download-only product from the FXpansion web shop! Pricing is $99, €79, £69 inc. VAT where applicable. 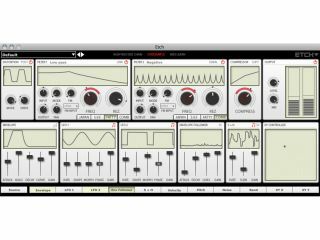 Introductory Offer: Etch is $70, €55, £48 inc. VAT for all registered owners of Geist, DCAM: Synth Squad, Tremor, BFD2 and BFD Eco (and customers purchasing Etch at the same time any of these products) until 30 April 2012.